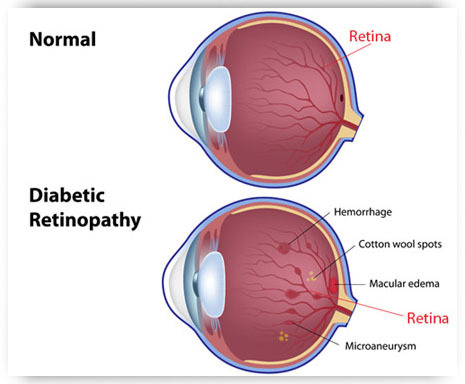 Diabetic retinopathy, or Diabetic Eye Disease affects the retina and its blood vessels in people with diabetes. In the early stages of diabetes, patients don’t know they have a problem; in the worst cases,diabetic retinopathy can blind patients. Diabetic Retinopathy occurs when a person with diabetes does not control their blood sugar. The result is bleeding and swelling inside the retina. An annual eye exam is very important to screen for this serious disease. In some cases, fluid leakage in the central area of the retina can cause distorted or blurred vision in the early stages, and central vision loss if it progresses to end stage. In other cases, new blood vessel growth in any part of the retina can scar and shrink, leading to retinal detachment causing blindness. The type of vision loss with Diabetic Retinopathy is sometimes akin to Glaucoma and Macular Degeneration. If left untreated, diabetic retinopathy can lead to blindness. Diabetics are encouraged to take their prescribed medication as directed by their physician, exercise regularly, watch their diet, and have regular eye examinations in order to help prevent diabetic retinopathy. A timely referral may be made to a specialist for surgery to help preserve vision. Schedule a comprehensive eye examination as recommended by your optometrist. Only a thorough eye examination is able to look for changes in the eye as a result of the disease. Maintaining good blood sugar control can delay or prevent the serious consequences of diabetic retinopathy.